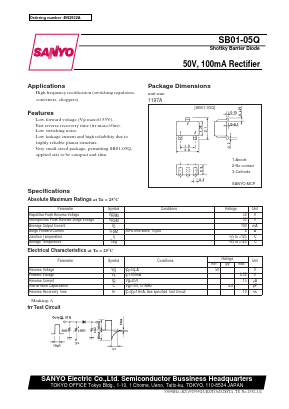 â¢ Low forward voltage (VF max=0.55V). â¢ Fast reverse recorvery time (trr max=10ns). â¢ Low leakage current and high reliability due to highly reliable planar structure. â¢ Very small-sized package, permitting SB01-05Q applied sets to be compact and slim. â¢ High frequency rectification (switching regulators, converters, choppers).